With the beginning of the new season we are starting to see more and more of the key trends filtering into the high street and online. And we are no different- we have got some brilliant check pieces that are on trend for AW18. So be sure to keep those eyes peeled. One of the biggest trends we have seen from the catwalks this years ready for Autumn is something that always makes an appearance but is coming back stronger this season. Heritage fabrics- think Prince of Wales checks, Tweed and other traditional check prints. We have got some fabulous check pieces coming through in our new collection that will keep your wardrobe up to date this Autumn Winter. Whether you are more traditional or can go bold with your prints there is something for you. A statement piece that is also traditional- a classic narrow leg Check Trouser in a subtle heritage check with blues and creams running through. Looks great styled more formal but also casual too- Pair them with a great blouse a classic white blouse would suit or if your feeling a little adventurous we a clashed the prints with our brand new Fluted Sleeve Blouse tying all the colours from the trousers together for a classic floral and check combination. If your wanting a more relaxed look grab a cosy sweater or sweatshirts and your favourite pair of pumps for a leisure feel. Either way you decided to style these, they are a classic style that will never date- so the perfect investment! For a more modern take on Checked trousers try our Pull On Trousers in a soft milano fabric with a bolder check running through. With the softer and elasticated fabric you wll have a closer fit, again paired with a casual pair of pumps or a smarter shoe depending on your mood. We’ve styled this with a pop of purple to really show off the bold check pattern but again these are so versatile they can be worn with a wide range of pieces that you probably already have sitting in your wardrobe. To get the look you can pair these great trousers with our Buttoned Cardigan with zig zag detailing. 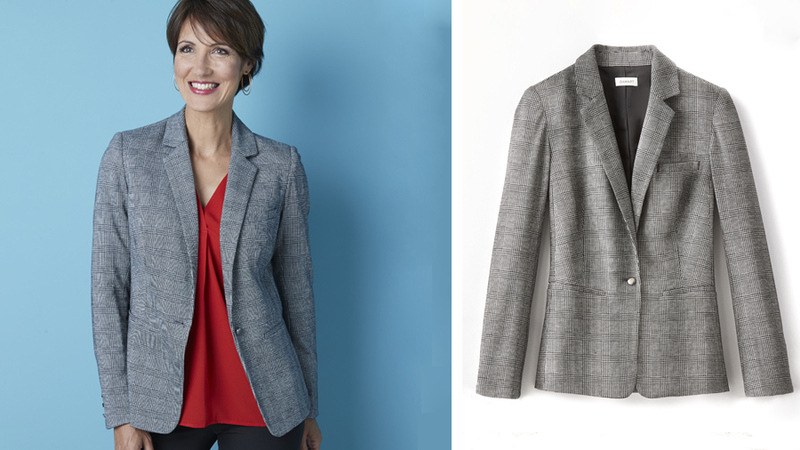 You can never go wrong with a classic blazer as an easy throw over layer- looking fabulous with more formal pieces whether for work or an event or with your favourite pair of trusty jeans for a more minimal, modern look. Our Knitted Jacket is new to our collection this year and not only available in a stunning Heritage check but also in three other coloursways so which ever you fancy it will slot right into your existing wardrobe. It is the ultimate layer you can never go wrong with and we are seeing the more and more on the catwalks with belts, skirts, trousers and dresses. But this statement check makes it a killer piece for this upcoming season. To shop all of our new collection click this link and happy shopping!